As the march of intensification moves eastward from Yonge, the intersection of Church and Wellesley -- the heart of our Village -- will look very different years from now. In early 2015, three landlords, who together owned five properties at the northwest corner of Church and Wellesley, put the buildings up for sale as a block. Developer ONE Properties eventually acquired the buildings at 66 Wellesley Street E. and 552-570 Church Street, home to several small businesses. ​In early 2017, the developer held three pre-proposal community consultations. ONE Properties then submitted an application to rezone the site in order to build a 43-storey mixed-use (rental) tower. On November 28, 2017 a Community Consultation was held. At that time many objections to the project as proposed were aired. It was at this meeting that ONE Properties offered an alternative development proposal which would include the apartment building at 64 Wellesley Street East. A summary of the Community Consultation feedback is contained within the City Staff Supplementary Report (Dec. 1, 2017). In February 2018, ONE Properties resubmitted its application to the City for a 39-storey mixed use tower containing 442 rental units, 4,800 square metres of retail space and a 320 square metre public space. 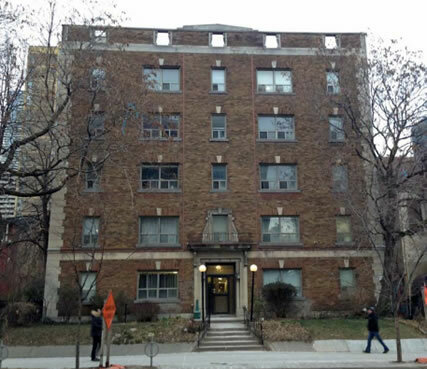 The new application included 64 Wellesley Street East, on which now stands the 5-storey apartment building adjacent to Paul Kane Park. Supporting documentation, including architectural plans and the shadow study, are available on this City of Toronto Development Application page. ​According to the report .... "Properties on the Heritage Register will be maintained and conserved in accordance with the Official Plan Heritage Policies. Designation enables City Council to review alterations to the site, enforce heritage property standards and maintenance, and refuse demolition" (emphasis added). ONE Properties has replaced its architectural team and is working on an alternate proposal for the site; however a revised application has not yet been submitted. This page will be updated as events unfold.